Common Names: Black Torch, Pigeon Berry, Parrot Apple. Habit: Erithalis fruticosa grows as a medium shrub to small tree up to 5 m in height (typically 1-2 m). The leaves are arranged oppositely with paired stipules at the petiole base. The leaves are to 10 cm in length, obovate to oblanceolate with an entire margin and a round to acute leaf apex. The leaves are primarily occurring at branch tips. The flowers are arranged in panicles. There are 5 partially fused greenish sepals in the calyx. There are 5 partially fused white petals in the corolla. There are 5 stamens. The ovary is inferior with a single locule containing many seeds. The fruit is a berry that turns white to red to dark purple/black at maturity. Habitat: Erithalis fruticosa grows primarily in coastal Dry Broadleaf Evergreen Formation –Shrublands (scrublands) on sand substrate but also at the edges and interiors of Forests and Woodlands on limestone substrates. Distribution in Bahamas/Globally: Erithalis fruticosa occurs on all island groups in the Bahamian Archipelago as well as Florida, the Caribbean region, and Central and South America. 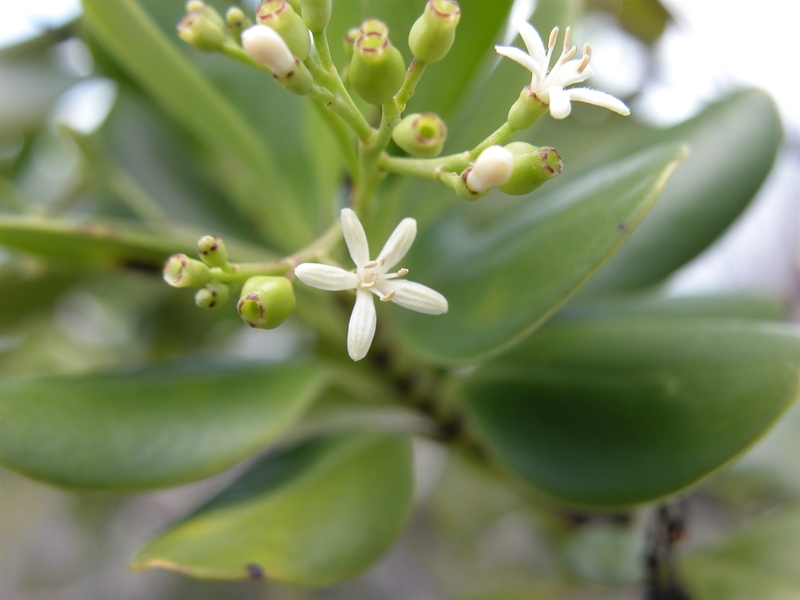 Medicinal/Cultural/Economic usage: Erithalis fruticosa teas made from combining all parts of the plant have been used to treat hemorrhoids, measles, and as a diuretic. It has been traditionally used as a torch for hunting land crabs. The wood is broken and shredded and then lit on fire. It produces a smoky fire. Erithalis fruticosa is now used in the horticultural industry, is a good attractor of birds and butterflies, and does well in coastal, salty, dry conditions.